Providing ongoing updates on initiatives related to the 2016 COACHE faculty satisfaction survey is the aim of the expanded COACHE website launched today by the Provost’s Office of Academic and Faculty Affairs. The site includes information on Office of the Provost initiatives and actions as well as information about some of the activities underway in the colleges and schools. Vanderbilt partnered with the Collaborative on Academic Careers in Higher Education (COACHE) to conduct a survey of the faculty, which was administered from Feb. 2 to April 17, 2016, to identify the drivers of faculty success and to implement informed changes. 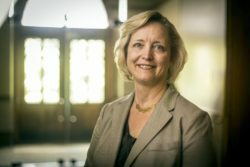 Wente appointed two working groups, the Faculty Working Group and the Deans Working Group, to analyze and assess the results of the faculty survey. The Faculty Working Group released its final report in late September. As recommend by the Faculty Working Group, the university plans to participate in the survey again in spring 2019 to allow for a comparison across time and will consider revised Vanderbilt-specific questions. The site will continue to be updated with new developments and contains a feedback form for faculty to submit recommendations and comments. Faculty also can submit feedback in person to Provost Wente at her “Open Dore, On Location” sessions held across campus and by emailing Provost@Vanderbilt.edu.